Home » Food n Beverage » Giant » gold » KFC » Panasonic » Petronas » purchase » Shopping » spend » vouchers » Panasonic Battery Peraduan "Whatsapp Dan Menang" Contest: Win Gold Coins, Petronas Gift Card, KFC & Giant vouchers! Panasonic Battery Peraduan "Whatsapp Dan Menang" Contest: Win Gold Coins, Petronas Gift Card, KFC & Giant vouchers! Purchase any Panasonic Battery product to enter this Contest. Participant who showed the most Panasonic Battery pack purchased during the monthly Contest Period will be chosen as the winner of that month. Participation of this Contest is only valid via WhatsApp. Participant need to take a photo which shows clearly the purchase receipt AND all the purchased product pack. 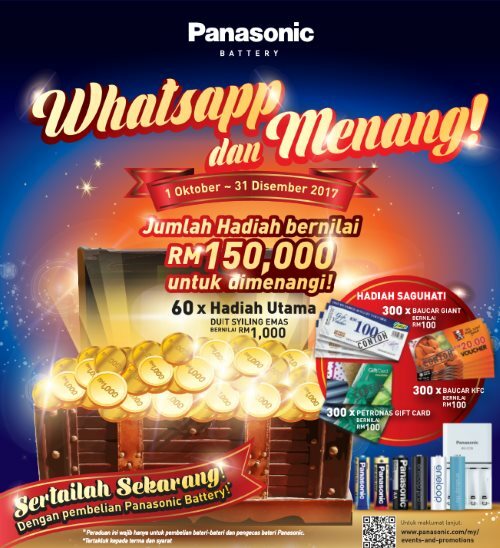 Visit Panasonic Battery "Whatsapp Dan Menang" Contest page for more details.